This past Friday the folks over at Engadget posted that a trusted source let them know that Sprint will be getting a CDMA Bold in the first quarter of 2009 to replace the 8830. 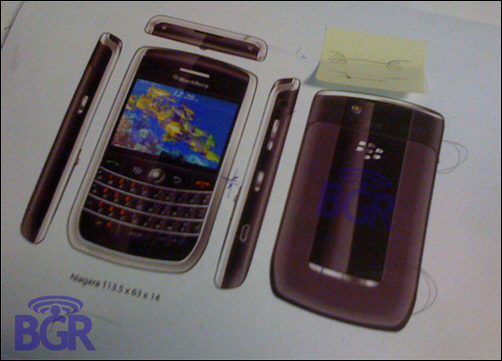 With the BlackBerry Bold being the successor to the 88xx series, you can expect the CDMA Bold (referred to by the codename "Niagra" up until this point) to eventually land everywhere the current 8830 is sold. Think back to CTIA last year with the launch of the 8330 Curve, and both Verizon and Sprint announced the coming of the device within 24 hours of each other. I wouldn't be suprised to see the same thing with the 9030. While the Niagra is a "Bold" it will have a slightly different look from its GSM-sibling. The CDMA Bold takes it styling queues from the Storm and Curve 8900 and with HSPA (yes this device has it) will be a true world phone. And like the 8830, once announced/released in the US to Sprint and Verizon it will make its way to other CDMA carriers (Alltel) and of course over the border to the Telus and Bells of the north. The CDMA BlackBerry goodness won't stop with the Niagra in 2009. A CDMA Pearl Flip is on the way (codenamed "Apex" until this point - I'd expect it to hit as the 8230) and hopefully before 2009 is over we'll also see the new Curve 8900 hit in CDMA form (8930 sounds about right to me but I guess time will tell!). Question of the Day: To any Sprint / Verizon / Telus / Bell customers reading this, which one of the above are you going to run out and buy first? !